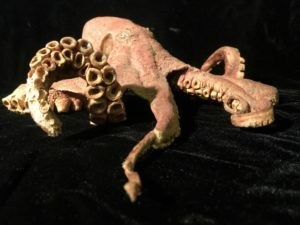 Our halls are filled by a menagerie of creatures, and this month we add to their number by taking a closer look at this small, taxidermied octopus. Most of the preserved creatures we have on exhibit are terrestrial animals like coyotes or birds. But not all animals are furry or feathered, of course. Some, like this octopus, are soft-bodied, requiring an entirely different taxidermy process. Given to the Museum in 1973, this octopus — species unknown — both adds to our depiction of marine life and represents an important distinction in taxidermy technique: rather than skinned and sculpted, it was freeze-dried by local taxidermy expert Richard Gurnee of Richard J. Gurnee Freeze Dri in Watsonville. Taxidermy is an old skill, and the technique of freeze-drying is a relatively young innovation in its field. Some folks trace the history of taxidermy to the ancient Egyptian practice of preserving humans and animals through mummification. However, the word “taxidermy” is composed of the Greek words “taxis,” meaning arrangement, and “dermis,” meaning skin, establishing taxidermy as the art of arranging skin rather than an umbrella term for preservation techniques like mummification. The word was coined in 1803 by Louis Dufresne, ornithologist and taxidermist for the French National Museum of Natural History. Early taxidermy was especially focused on removing and preserving a creature’s skin, then stretching the flesh over a frame designed to resemble the animal’s body. But many of these early frames were far from perfect. Crude wooden or metal frames often misrepresented an animal’s actual figure. In one classic example, the body shape of the dodo was widely misinterpreted for a number of years due, in part, to a poorly constructed taxidermy frame. In the 1950s and 1960s, it became industry standard to use molded plastic models or forms that more realistically captured body shape. Enter freeze-drying, where an entire animal is preserved through freezing and dehydration, almost eliminating the need for a frame. In this method, which greatly minimizes the need for artificial materials, a taxidermist inserts wires to bend and pose the body. They then freeze the specimen and review its position before drying. Once everything is properly posed, the creature is placed in a vacuum chamber under sub-freezing temperatures, which removes tissue-bound ice. This can take roughly three weeks for something small, like a quail, and three months for something larger, like a coyote. Then come the final touches: artificial eyes are used, as with any taxidermy, and some painting. While fur and feathers do not fade during the freezing process, skin and scales may require some paint to restore life-like coloration. Taxidermists use this method for more than wildlife — it can also preserve plants and fungi. Refrigeration advances in the early 1990s mean that, today, freeze-drying is commonplace. More than an advancement in taxidermy technique, our octopus also represents a significant person in the industry’s history: Watsonville resident and nature enthusiast Richard Gurnee, who completed his first taxidermy project in 1954 as a child in pursuit of a Boy Scout Merit Badge. He later studied zoology at Humboldt State University, and went on to work in a taxidermy shop while pursuing his master’s degree at UC Berkeley. Gurnee began to experiment with freeze-drying whole animals, having been inspired by scientists using the same technique to preserve tissue samples. While he was not alone in this insight, his pioneering work brought him to the Smithsonian Museum of Natural History, where he served as a taxidermist for several years. Fortunately for us, he returned home to Watsonville in the 1960s to start his own taxidermy business. Gurnee has taxidermied specimens for museums across the country, including our collection here in Santa Cruz. When you stop in to see this month’s Close-Up, be sure to check out our other cases, as many of them feature Gurnee’s handiwork. And if you find yourself in the mood for talking taxidermy, be sure to visit us for the Museum of the Macabre later this month, where you can witness the taxidermy process firsthand!